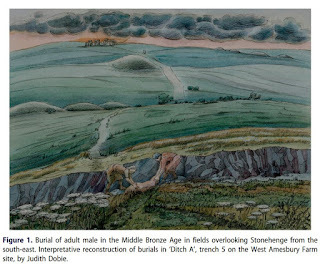 Recent survey, excavation and analysis in the Stonehenge World Heritage Site (WHS) during 2015 and 2016 has revealed new details of landscape structuration and the deposition of the dead during the Middle Bronze Age. 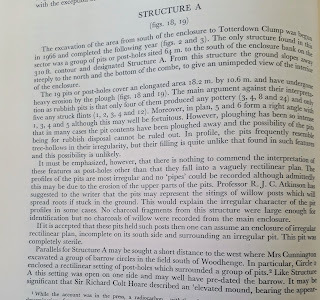 The research reported here demonstrates the existence of early fields or enclosures in the eastern part of the WHS, that was previously thought to be an area of little agricultural or domestic activity in the Bronze Age. These features were succeeded by a major ditch system in which two individuals were buried, an unusual way of dealing with the dead in the Middle Bronze Age. At the same time, the body of a perinatal infant was deposited in a palisade ditch in the western part of the WHS. 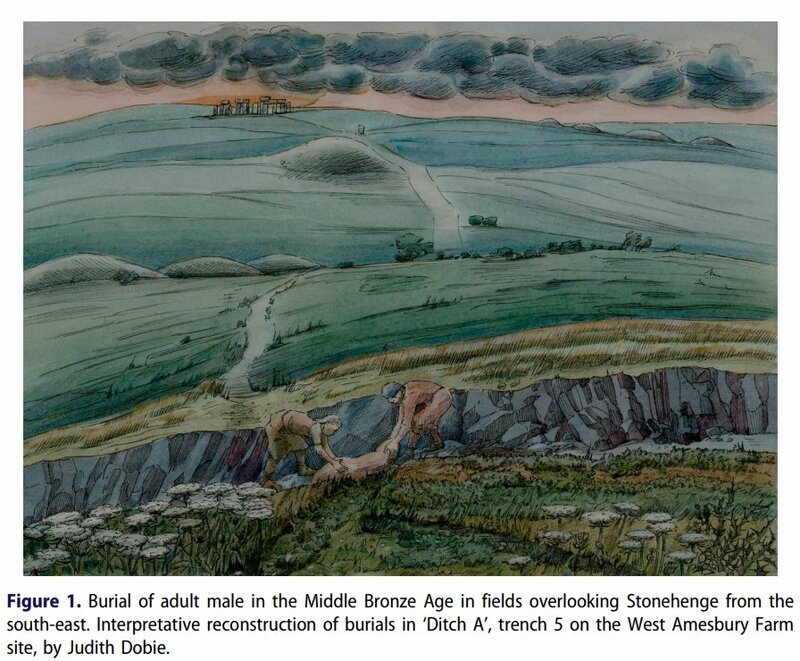 The paper explores how these actions help elucidate a period of significant change in the landscape around Stonehenge, during which natural features, ancestral monuments and the recent dead were enmeshed in complex ways of bounding and dividing the landscape. 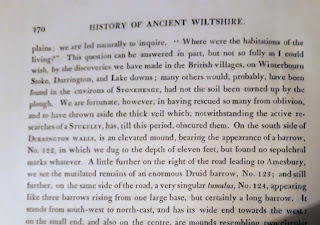 Archaeological investigation of a square enclosure on King Barrow Ridge, Amesbury, Wiltshire. Historic England Research Report Series 58-2017.. 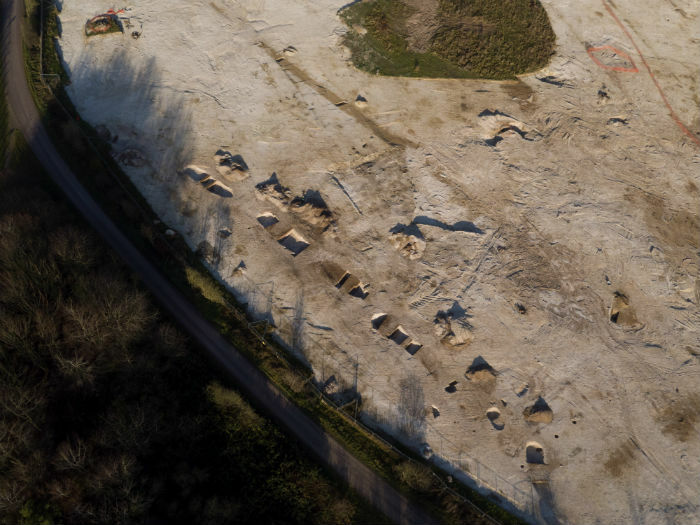 Historic England archaeologists investigated a square enclosure on King Barrow Ridge, c.1km east of Stonehenge, as part of the Stonehenge Southern World Heritage Site Survey project. The enclosure had been mapped from aerial photography, geophysical survey and previously evaluated in 1993. Extensive further excavation was undertaken of the south-east corner of the enclosure. Despite extensive sampling for finds and environmental remains, only very limited evidence could be retrieved to date and characterise the enclosure. This report sets out the evidence from these recent investigations, and explores morphologically similar features across the region. 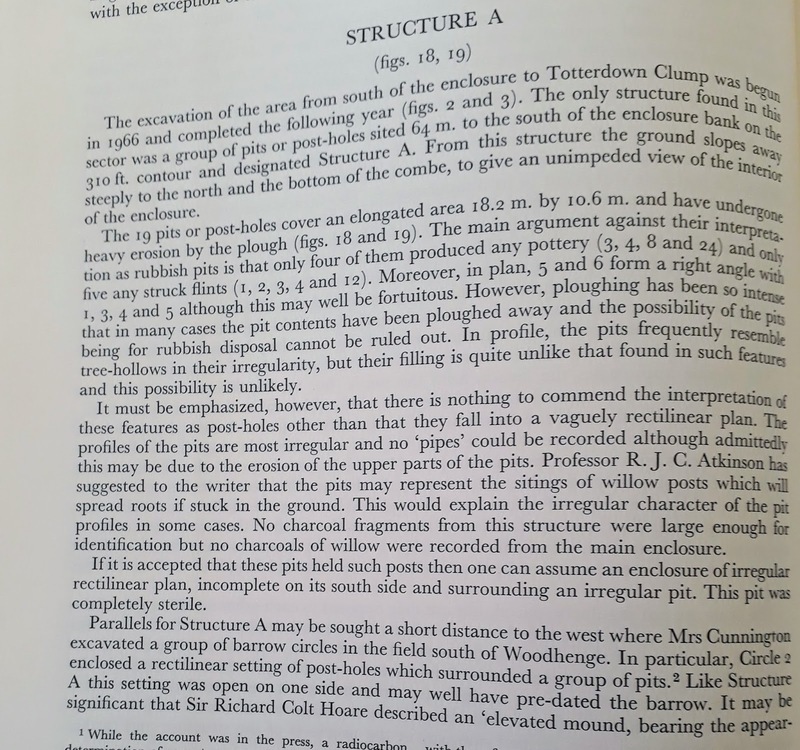 In conclusion, whilst the most viable interpretation may be a Neolithic mortuary enclosure, it is also possible that the feature is a square barrow or sheepfold. 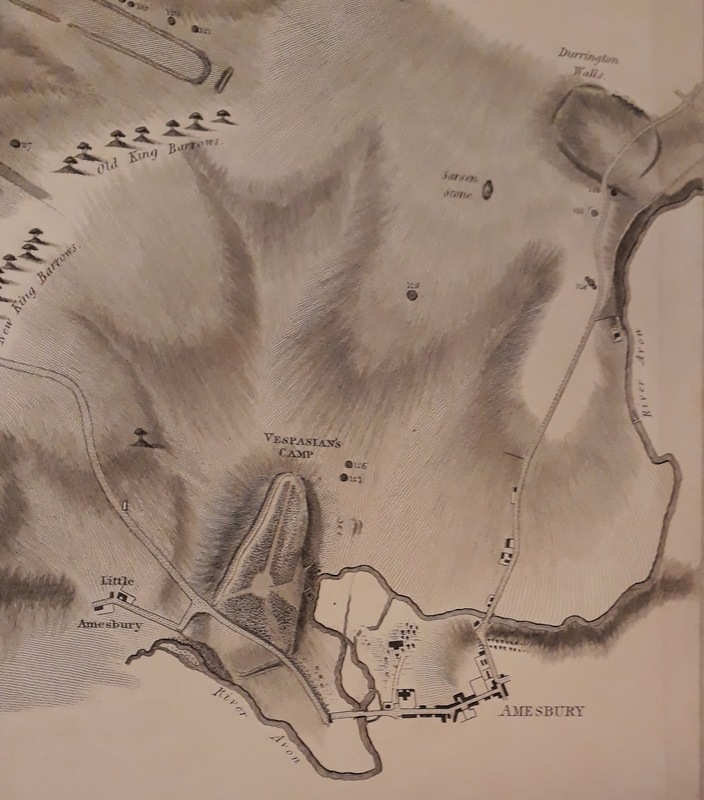 If any further work is undertaken on the site it should explore the interior and northern/western ditches, but it would be better that the site be left in situ for the foreseeable future. The roles of migration, admixture and acculturation in the European transition to farming have been debated for over 100 years. Genome-wide ancient DNA studies indicate predominantly Anatolian ancestry for continental Neolithic farmers, but also variable admixture with local Mesolithic hunter-gatherers. Neolithic cultures first appear in Britain c. 6000 years ago (kBP), a millennium after they appear in adjacent areas of northwestern continental Europe. However, the pattern and process of the British Neolithic transition remains unclear. We assembled genome-wide data from six Mesolithic and 67 Neolithic individuals found in Britain, dating from 10.5-4.5 kBP, a dataset that includes 22 newly reported individuals and the first genomic data from British Mesolithic hunter-gatherers. 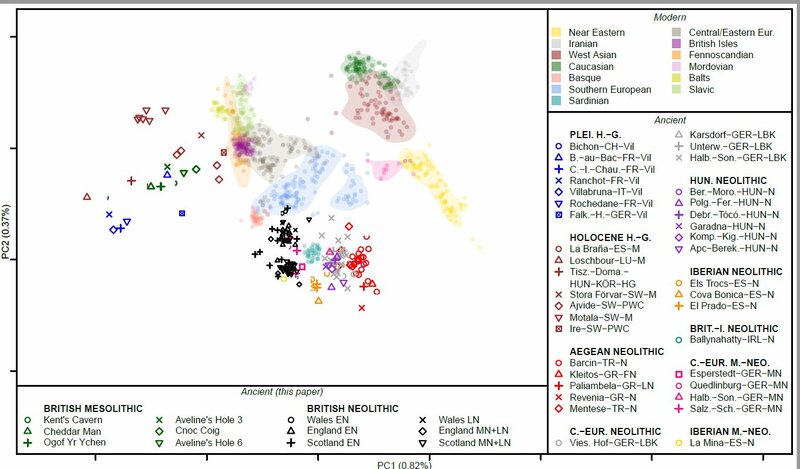 Our analyses reveals persistent genetic affinities between Mesolithic British and Western European hunter-gatherers over a period spanning Britain’s separation from continental Europe. We find overwhelming support for agriculture being introduced by incoming continental farmers, with small and geographically structured levels of additional hunter-gatherer introgression. We find genetic affinity between British and Iberian Neolithic populations indicating that British Neolithic people derived much of their ancestry from Anatolian farmers who originally followed the Mediterranean route of dispersal and likely entered Britain from northwestern mainland Europe. In summary, our results indicate that the progression of the Neolithic in Britain was unusual when compared to other previously studied European regions. Rather than reflecting the slow admixture processes that occurred between ANFs and local hunter-gatherer groups in areas of continental Europe, we infer a British Neolithic proceeding with little introgression from resident foragers – either during initial colonization phase, or throughout the Neolithic. This may reflect the fact that farming arrived in Britain a couple of thousand years later than it did in Europe. The farming population who arrived in Britain may have mastered more of the technologies needed to thrive in northern and western Europe than the farmers who had first expanded into these areas. A large-scale seaborne movement of established Neolithic groups leading to the rapid establishment of the first agrarian and pastoral economies across Britain, provides a plausible scenario for the scale of genetic and cultural change in Britain. This article is a preprint and has not been peer-reviewed. 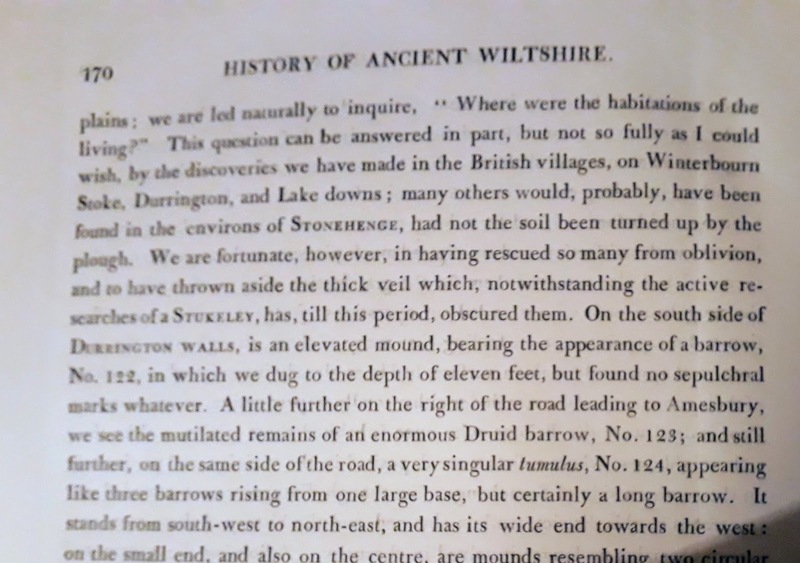 These photos are taken from Colt Hoare's The Ancient History of Wiltshire (engraving by James Basire after Philip Croker) and Geoffrey Wainwright's report on his excavations of Durrington Walls. Apologies for the quality of the snaps, when I have time I will retake them and write them up at length. Structure A was just south of the bank and ditch and is no more. That Hoare could dig 3.3m down into it shows it was big. Was it a barrow or a mound? b) create new chalk grassland and other habitats and extend the existing Parsonage Down habitats. This has been successfully achieved at other sites where chalk tunnelling excavations have been used for habitat creation, such as at Samphire Hoe near Dover using spoil from the channel tunnel. 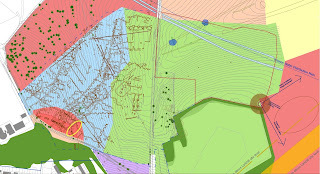 Construction of the proposed scheme would generate a large volume of excavated material from the tunnel, and this material would generally be unsuitable for use as an engineering fill material in highway embankments The excavated material arising from tunnelling is likely to be in the form of a finely ground slurry or paste and would require processing to reduce the water content sufficiently to make it suitable for handling and re-use. The excavated materials processing plant is likely to be located within the main production area. Once suitable for use the material would be used for essential landscaping mitigation and new habitat creation to increase biodiversity. The principal area of use would be the land to the east of Parsonage Down National Nature Reserve. In addition to the need for essential landscape mitigation in this area, the material would be used to create areas of new chalk grassland and other habitats and create an extension of the existing Parsonage Down habitats. Use of excavated material from the tunnel in this way would minimise the need to transport this material on the highway network to landfill sites. This would minimise the environmental impacts associated with the construction of the proposed scheme, particularly in relation to the air quality and noise impacts of construction traffic on people and communities living along potential off-site excavated materials disposal routes. This strategy would also help reduce greenhouse gas emissions during the construction phase. In addition to the tunnel arisings, excavation would also be required in places to form cuttings for the highway and this material would then be used to form embankments. The design aims to balance these requirements as far as practicable. Phosphatic Chalk is known to be present within the Stonehenge Bottom area of the study area and these deposits are likely to be encountered during tunnel boring. (This material is expected to have a higher phosphorus content compared to normal Chalk). The engineering and hydrogeological characteristics and spatial extents of this material will be investigated further as the design develops and will be reported in full in the ES. The key environmental effect is considered to be the potential adverse effect of the degradation in water quality of the River Till or Avon through eutrophication as a result of nutrient loading, should the material be placed nearby and leaching then occur. To mitigate this, additional investigations and risk assessment, will be undertaken prior to any storage and re-use of excavated materials. These assessments will ensure that the storage and reuse of Chalk arisings at any particular location would not result in an impact on water quality. 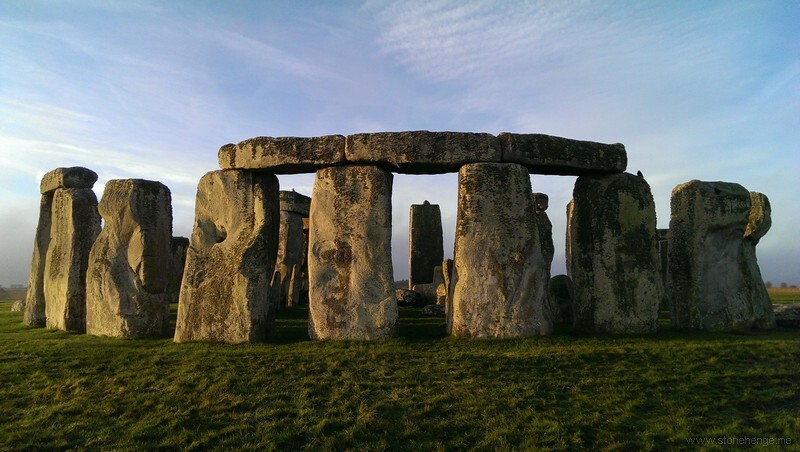 Additional investigations are being undertaken to establish the leachate potential of phosphorus in the Phosphatic Chalk at Stonehenge Bottom and the possible risks posed to controlled waters should the material be excavated and re-used within the study area. There are also uranium-bearing minerals within the Phosphatic Chalk which could give rise to increased radon emissions. However, since radon is a noble gas, it does not absorb to air particulates and in an outside environment, it is dispersed to such an extent that it represents no significant risk. The impact and any possible effect during construction within confined environments, like the tunnel, will be mitigated. A question from a concerned friend of Blick Mead. What evidence or expert opinion is there that the proposed A303 scheme will damage or poses a credible serious risk to the archaeology of Blick Mead? Anyone who knows me or reads this blog will know I'm happy to wade head first into the fray if I feel the evidence backs me up. But to be frank if I, who am instinctively on the side of the Blick Mead campaigners, am finding it hard to understand their campaign then if they are to convince others they need to produce some clear evidence and publicise it.. Fact one - the mesolithic site continues under the road. Yes, but it was trashed 50 years ago by the construction of the present A303, though a watching brief would be sensible. The new construction is all within the existing road footprint, no untouched areas will be touched. Fact two - Blick Mead depends on groundwater fed springs. The ground water levels vary hugely through out the year and from year to year already. Highways England have put out comprehensive reports (links below) which say that with care and mitigation measures that "No likely significant effects are anticipated." Are there any expert opinions that say otherwise? What else am I missing that is relevant to the very narrow question I am asking? Please note I am asking a very precise question and I am not asking about anything else to do with the plan. The Government decided in September to go ahead with a tunnel at Stonehenge but did not assess the environmental impact of the archaeological site Blick Mead – a mile and a half away – the only place in Great Britain that can trace people living there since the end of the Ice Age, claims a University of Buckingham archaeologist. On documents the Government has incorrectly sited the Blick Mead excavation, in a place where the construction of the tunnel, and also a flyover, would be less damaging, he has pointed out. The building of the flyover and the tunnel is likely to drop the water table and result in the loss of the current peat and silty conditions which preserve foot prints and other crucial evidence which dates the site. There are just 10 more weeks before the government’s consultation closes so time is running out for those who want to challenge the plans. At the most recent excavation, the latest in a decade of digging at Blick Mead led by University of Buckingham archaeologist David Jacques, perfectly preserved wild cows (aurochs) footprints have been found. They have been preserved under a stone surface, a sign that they were deliberately intended to be preserved for ritualistic reasons because aurochs were believed to be sacred. Carbon dating revealed they are more than 6,000 years old which is the oldest signs of real life yet uncovered at Stonehenge. Previous digs have unearthed a home, plentiful signs of feasting and human settlement in this area including having cooked frogs’ legs but the site of all these finds would be damaged irrevocably if the flyover and tunnel go ahead. The Blick Mead site has built up a timeline revealing that hunter / gatherers came to Blick Mead between 8,000-4,000 BC, making the site the most long-used in British history in the whole of the country. Unlike anywhere else in Britain, nomads, the previous occupants, were there at the time the first farmers settled in the Stonehenge area, having come across from the continent. The contact between the two groups may be the key to unlock why Stonehenge was built where it was as the nomads had made monuments there and seen it as sacred thousands of years before could have passed these beliefs on to the new settlers. However, the crucial place of evidence, which is the only place in the country where British history can be traced back to the end of the Ice Age, will be destroyed by the flyover and the tunnel. 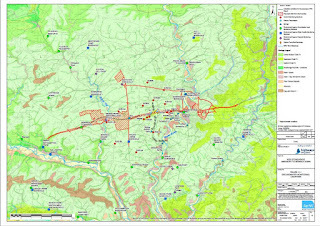 "We can see that mine activity accelerated rapidly after beginning around 4500 cal. BC, in advance of the Neolithic population increase in Britain and Ireland, leading the population curve by around 200 years (though our method will tend to exaggerate the effect of the early end of the individual date probability distributions for both the mines and the population). 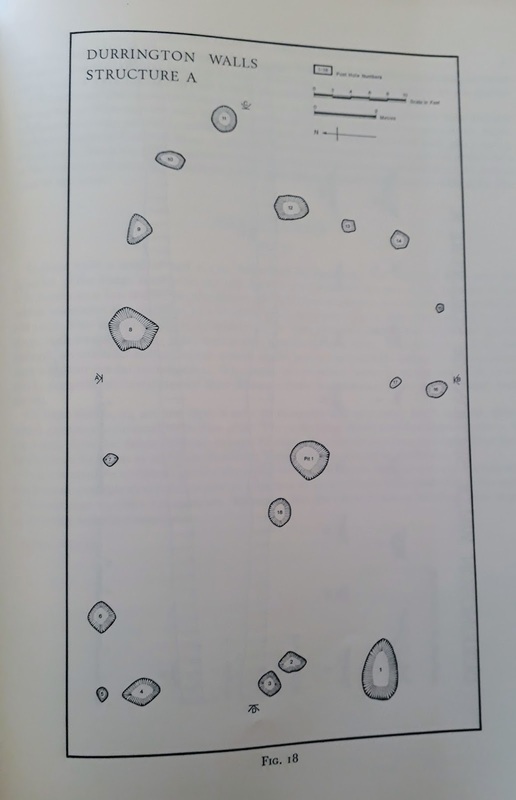 Since the main products of the mines and quarries were axes it seems likely that this corresponds to a period of forest clearance by the immigrant groups who introduced farming to Britain and Ireland at this time (Olalde et al. 2017). Mining activity then declined, before rising again around 3000 cal. BC. The hinterland population decreased sharply after this, and when it recovered from 2500 cal. BC onwards, flint and stone mining did not return, probably because the first copper metallurgy was introduced at this time." Published: 14 December 2017 Copyright: © 2017 The Author(s). This is an open-access article distributed under the terms of the Creative Commons Attribution 4.0 International License (CC-BY 4.0), which permits unrestricted use, distribution, and reproduction in any medium, provided the original author and source are credited. See http://creativecommons.org/licenses/by/4.0/. The public consultation is now open, and will run from Thursday 8 February to Friday 6 April 2018. Feedback from this public consultation will help Highways England in their continued development of the scheme to the time when they submit their application for planning consent (known as a Development Consent Order) to the Planning Inspectorate. Further information about the consultation is available on the Highways England's website and the response form to use to submit your feedback is available on the consultation page. 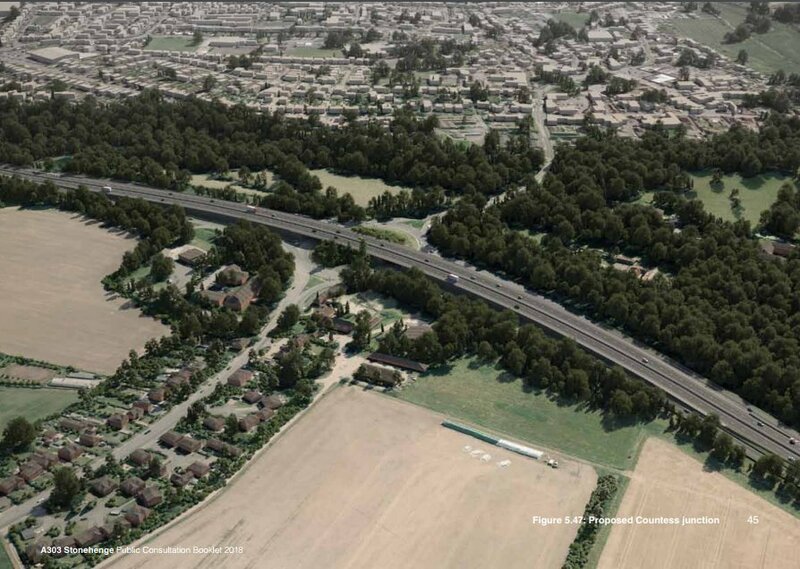 Concerns are in the press today that the proposed new flyover near Blick Mead could obliterate the ancient and fascinating site. - see Arianna Huffington's Weblog for example. The Highways Agency has been criticised for circulating an inaccurately labelled plan of their proposal. 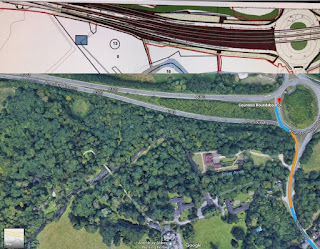 This is the plan (sans labels) and the Google view of the existing junction. 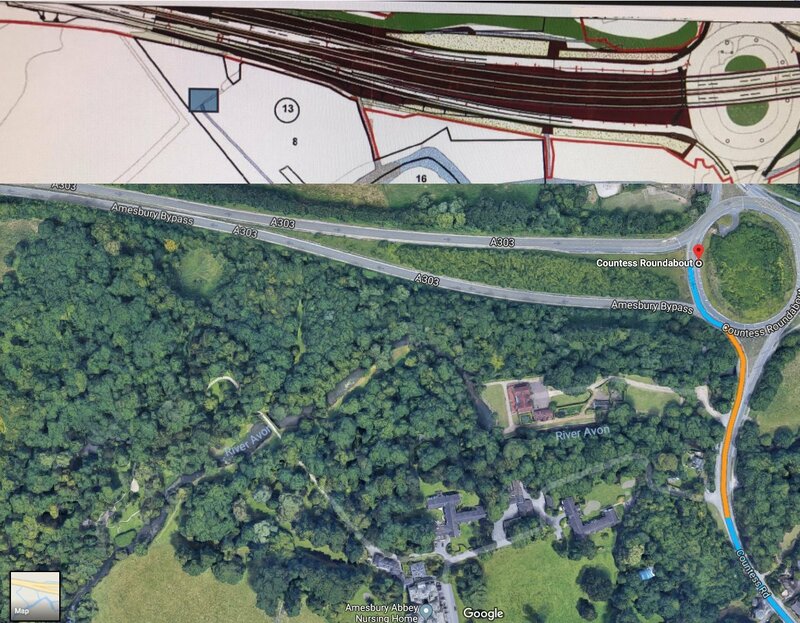 It appears that the proposed junction footprint is within the existing road area. The worries over the effect on the water table, the construction process and the raised height of the road are all matters of concern. The proposals are to be discussed at a series of meetings in the next few months. Your views will be welcomed. With The Guardian now reporting this I thought it worthwhile to provide the plan that they don't. The community that built the Neolithic causewayed enclosure at Larkhill which has been dated to between 3650 to 3750 BC, pre-dating Stonehenge by 600 years may have been the architects of the Stonehenge landscape that we see today. Project manager Si Cleggett now believes that the community who built the causewayed enclosure may have been more closely involved in the planning of Stonehenge than previously thought. 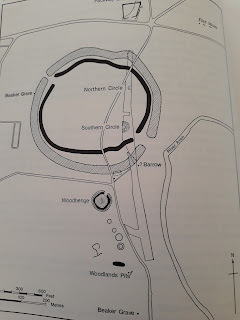 "The causewayed enclosure at Larkhill was constructed during the late Stone Age, a period of transition when our ancestors gradually moved away from a mobile hunter-gatherer lifestyle and embraced a farming existence where the domestication of livestock and control of agriculture began. 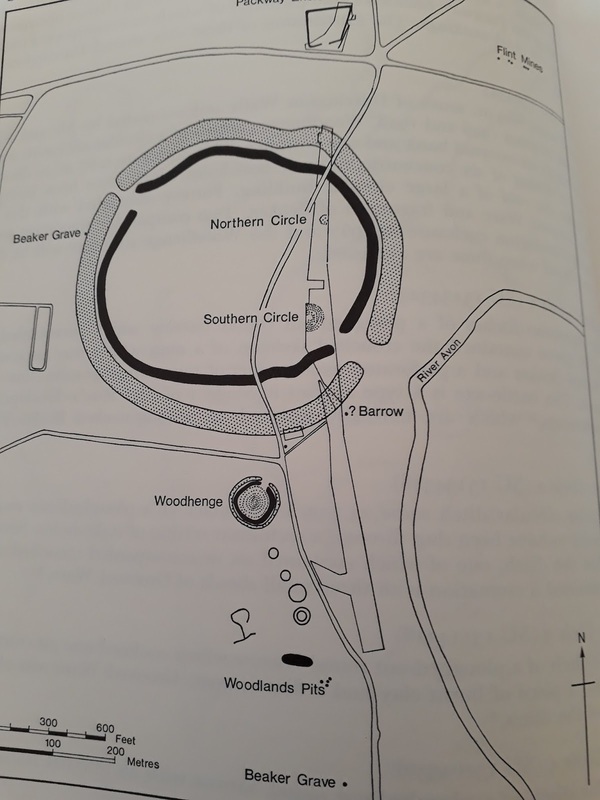 "The communities who gathered at the Larkhill Causewayed Enclosure during the Early Neolithic were there 600 years before the landscape setting of Stonehenge was conceived and may have been involved in the conceptualisation or even the creation of the landscape we see today. "It is enormously fitting that thousands of years later, those that strive to protect our identity as a nation will again meet at Larkhill through the delivery of service family housing." The Neolithic causewayed enclosure found at Larkhill was allowed to silt, was re-cut and then backfilled. During the early stages of the subsequent Beaker period a five-post alignment was driven through the now-filled ditch at the causewayed enclosure entrance on an orientation almost identical to what would later become the orientation of the stones of Stonehenge in relation to the rising and setting of the sun during solstices. From the planning documents, I have clipped the map showing the enclosure and highlighted the posts with a yellow eclipse. 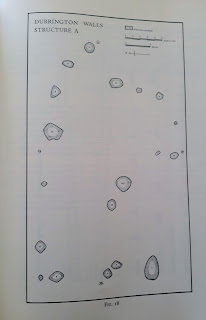 The Solstice alignments from Stonehenge are shown on the bottom right with a thin and thick golden line.